George Brooks is a prolific and diverse saxophonist and composer, acclaimed for successfully bridging the worlds of jazz and Indian classical music. He is the founder of Indian fusion groups Summit with Zakir Hussain, Steve Smith, Kai Eckhardt and Fareed Haque; Bombay Jazz with Larry Coryell and Ronu Majumdar; the Raga Bop Trio with Steve Smith and Carnatic guitarist Prasanna and Elements with Indian violinist Kala Ramnath and Dutch harpist Gwyneth Wentink. Brooks began his study of jazz with Count Basie saxophonist, Frank Foster and continued at the New England Conservatory of Music, with George Russell, Joe Allard and Jaki Byard. While attending the Conservatory, Brooks was introduced to Indian classical music and became entranced by its melodic beauty, rhythmic complexity and deep spiritual core. After graduating, Brooks traveled to India where he met master vocalist Pandit Pran Nath, the giant of north Indian music who deeply influenced pioneering composers LaMonte Young and Terry Riley. Brooks immersed himself in study with Pran Nath, cooking and caring for his “Guruji”, in exchange for knowledge. This is the traditional Indian style of learning known as “guru-shishya parampara”. Returning from India, Brooks settled in California and began his long association with pianist Terry Riley. For the past thirty years they have performed throughout Europe, the US and Asia as a duo, in trio settings with sitarist Krishna Bhatt and with a variety of larger ensembles. While touring with Riley and developing his unique voice as an artist, Brooks also became a mainstay of the Bay Area blues scene, arranging and leading horn sections for Sonny Rhodes, Frankie Lee, Albert Collins and Johnny Taylor and touring internationally with R+B icon Etta James. In 1996, Brooks recorded Lasting Impression and two years later Night Spinner, for Zakir Hussain’s Moment Records. These recordings received wide acclaim as landmarks at the intersection of jazz and Indian classical music. Brooks was hailed as the “leading voice in Indian Jazz fusion.” He was soon performing and recording with India’s most prominent artists including Hussain, Hariprasad Chaurasia, Sultan Khan, Aashish Khan, Shankar Mahadevan and L. Subramaniam. In 2000 Brooks recorded Summit, another grounding breaking work of Indian/jazz fusion featuring Zakir Hussain and Journey drummer Steve Smith. Summit performed throughout the US, Europe and Asia, incorporating guest performers Niladri Kumar, Vikku Vinayakram, Fazal Qureshi and Hariprasad Chaurasia. Brooks was first invited to perform in India in 2001 for the Jazz Yatra and has performed in India every year since at such prominent venues as Nehru Center and NCPA in Mumbai; the Music Academy in Chennai; Chowdiah Hall, Bangalore; Kamani Auditorium, Delhi; Saptak Festival, Elephanta Festival, Kala Ghoda Festival, Kolkata Jazz Festival and many others. Additionally Brooks has performed at the Queen Elisabeth Hall and Barbican, London; the Muziekgebouw and Concertgebouw, Netherlands; Lille Opera House, France; Esplanade, Singapore; Istanbul International Jazz Festival and jazz clubs throughout the world. In 2008 Brooks was featured as a soloist on John McLaughlin’s Floating Point CD, recorded in India and nominated for a Grammy award as best contemporary jazz album. 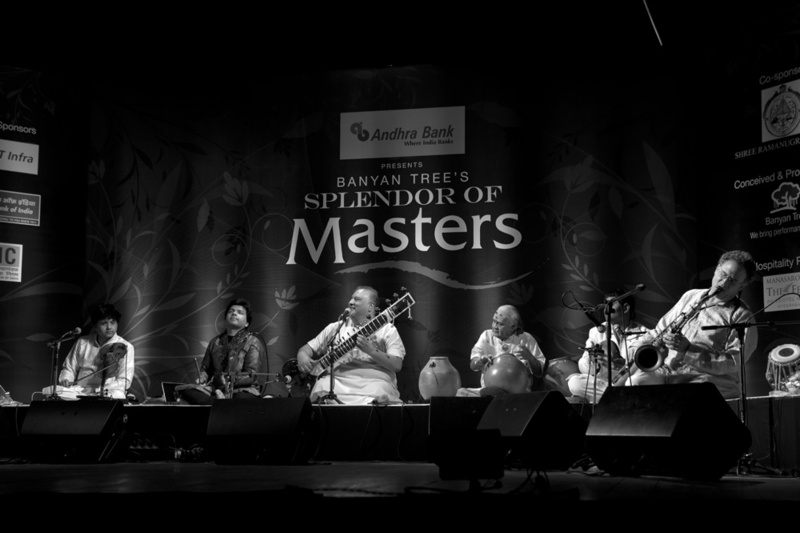 In 2010 Brooks released three distinctive recordings; Spirit and Spice with Summit and special guests, Zakir Hussain, Niladri Kumar Swapan Chaudhuri and Kala Ramnath; Elements a blend of western classical, Indian classical and jazz featuring violinist Kala Ramnath and Dutch harpist Gwyneth Wentink; and the Raga Bop Trio with Steve Smith and Carnatic guitarist Prasanna. In 2010 Brooks also toured Europe and the UK with Terry Riley and Talvin Singh to celebrate Riley’s 75th birthday. Brooks has received numerous awards and grants including the 2002 Arts International touring grant and the 2004 Arts International study grant. In 2007 he received the American Composers Forum, Global Harmony Prize to create the score for Mirrors of Mumbai, a contemporary Indian Jazz Opera (book by Sonal Acharya). In 2008, the American Composers Forum and the California Jazz Conservatory commissioned Brooks to compose and perform Double Moire, featuring the text and performance of beat poet Michael McClure. In 2009 the SFMOMA commissioned Brooks to create and “artist’s response” to the museum’s new Rooftop Sculpture Garden. Brooks received a 2012 Met Life Creative Connections grant and a 2012 New Music USA, Composer Assistance Program award to attend the premiere his solo harp composition “The Alchemy of Happiness”, at the Gaudeamus Muziekweek in Utrecht, Netherlands. In 2013 Brooks received a Mid – Atlantic, USArtists International grant to present his group Summit at jazz festivals in Kolkata and Mumbai. In 2014 “Ghalib” – for saxophone, sarode and tabla was commissioned by the San Francisco Friends of Chamber Music, and premiered in Oakland, CA. With Zakir Hussain, Brooks wrote and arranged the score for the Yo-Yo Ma, Mark Morris collaboration Kolam and the Merchant/Ivory film The Mystic Masseur. He has also arranged and performed with Hussain for the films Parzania, One-Dollar Curry and For Real starring Sarita Chaudhuri (Mississippi Masala). 2015 highlights include collaborations with Carnatic saxophonist Kadri Gopalnath; performances with Shujaat Khan and Vikku Vinayakram; recording and performing with Sonu Nigam, Bikram Ghosh and sufi-rock pioneers, Indian Ocean; release of Larry Coryell’s “Heavy Feel” CD; festival performances with Bombay Jazz and the introduction of Aspada, Brooks’ latest collaboration with Carnatic percussionist V. Selvaganesh. 2016 has brought an ASPADA tour of India; concert at the Cape Town Jazz Festival with Santoor exponent Rahul Sharma; Elements in concert for NBD Classics at the DUCTAC Theater, Dubai. In addition to performing and composing, Brooks has taught on the faculties of UC Santa Cruz, Mills College and the California Jazz Conservatory in Berkeley, CA and leads master classes at colleges and schools around the world. Click here to download George Brooks’ bio.